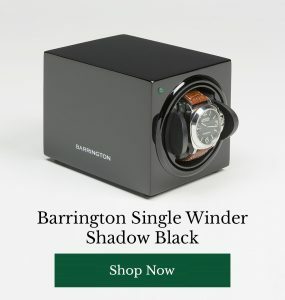 Finding the right waterproof watch isn’t that difficult, but finding one to invest in that will last is a different story. Diver watches are the most popular choice for those looking for a water resistant watch that can last more than just a puddle. Cheap ‘waterproof’ watches might come at a reduced cost, but breaking them will become a common occurrence. 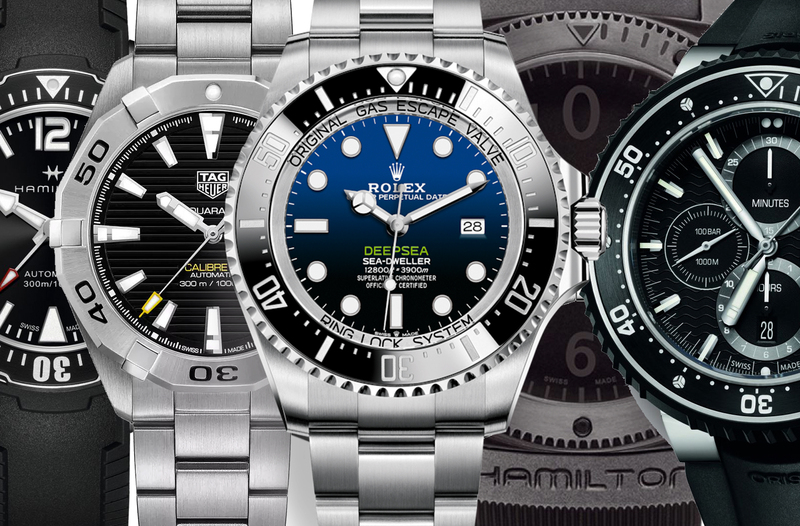 The best waterproof watches should be able to withstand deep diving without letting any water in. 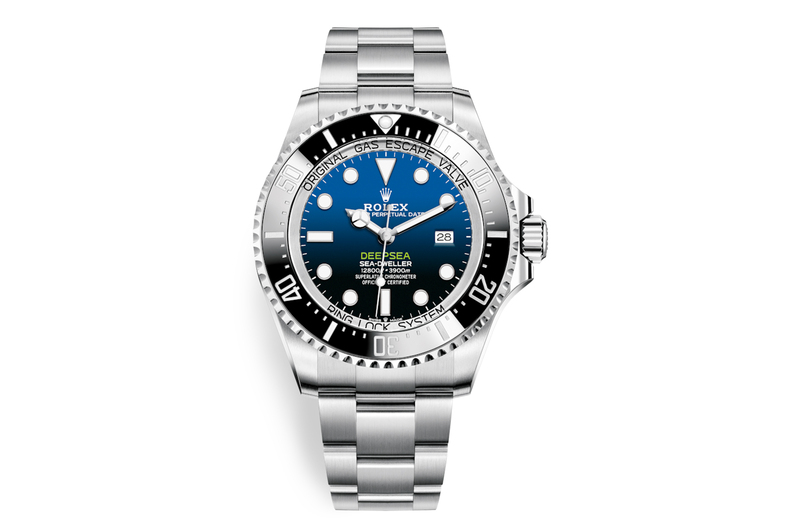 At the top of our list for waterproof watches is Rolex’s Deepsea D-Blue Dial Diver watch. Considered the big boy of all diving watches, this Rolex is waterproof up to 3900 meters, 10 times deeper than the world record for the deepest scuba dive. 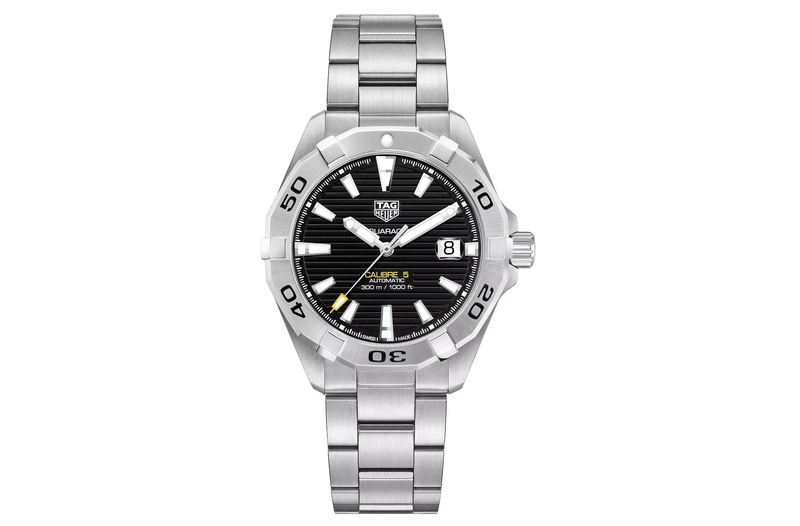 The watch was engineered for deep-sea exploration so goes above and beyond the needs for a waterproof watch. The D-Blue dial was created to commemorate James Cameron’s historic solo dive which saw the film-maker dive down to a record-breaking 10,908 meters below the surface of the Pacific Ocean in the Deepsea Challenger vessel of which he wore a Rolex. – Can withstand a 3900 meter dive. 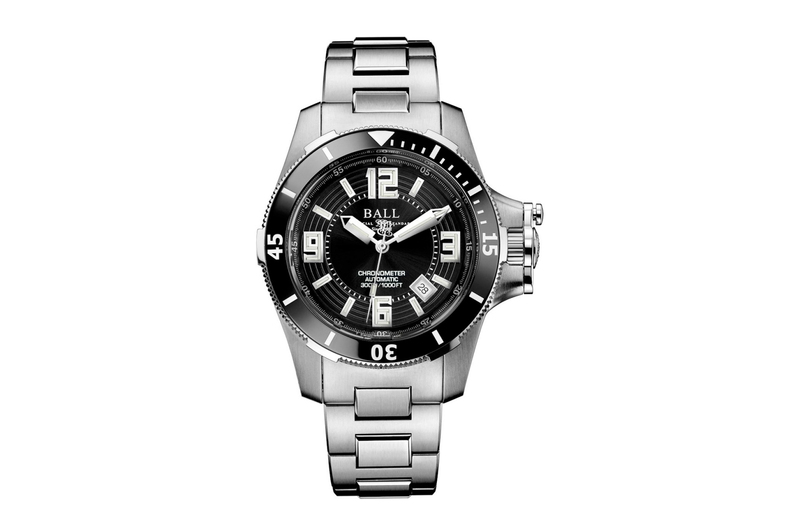 – Helium Escape Valve which is needed for divers coming back up to the surface as helium trying to escape the waterproof casing could force the crystal out of the watch case. – Oyster Bracelet with an Oysterlock clasp which prevents accidental opening. – Oystersteel casing, made of materials used in the aerospace and chemical industries. 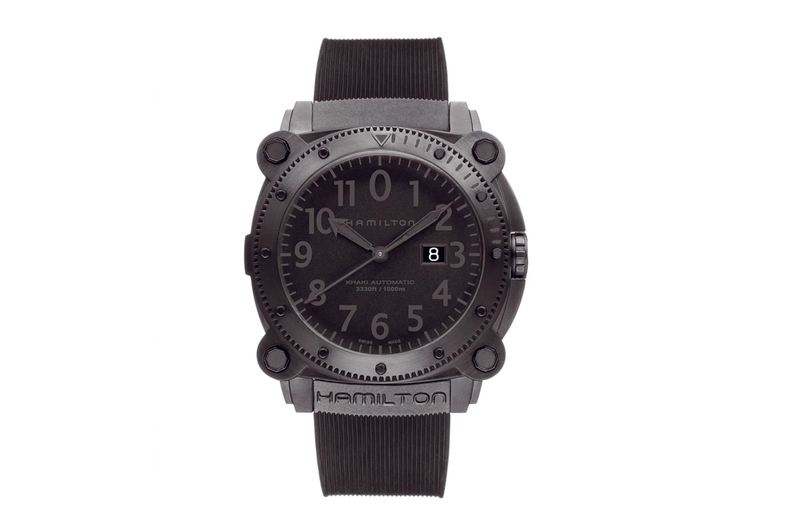 Hamilton’s Khaki BelowZero watch lives up to it’s name. Water resistant up to a phenomenal 1000 meters and equipped with a helium escape valve, the BelowZero is a fantastic option for the enthusiast looking for something a bit more affordable than the Rolex. Setting you back £1370, it’s a watch designed for ‘marine pioneers’. 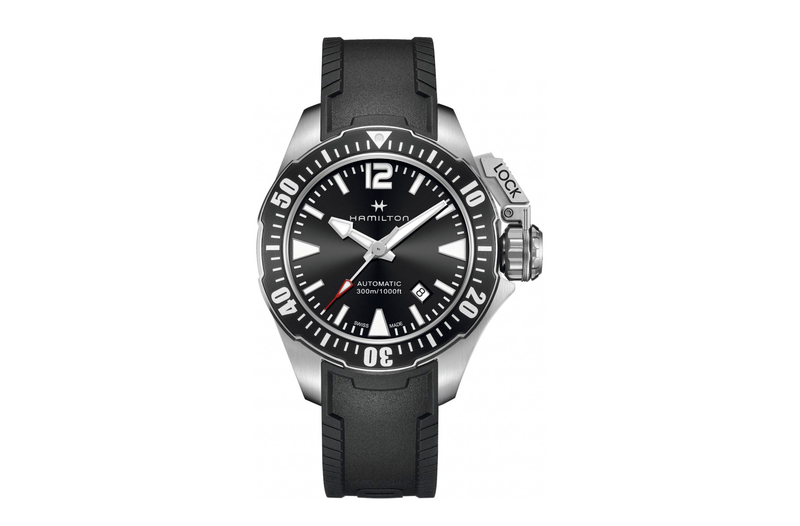 – Water resistant up to 1000 meters. – High performance protection convex sapphire crystal. – Black PVD-treated 46mm stainless steel case. – Water resistant case up to 300 meters. – Polished steel and ceramic bezel. – Sapphire cystal with anti-reflective treatment. – A case depth of 12mm. – Heavy duty stainless steel bracelet. – Luminous gas light tubes for low visibility environment. – Ceramic bezel that’s scratch resistant and a scratch resistant, anti reflective sapphire crystal. – Stainless steel case (but visually not as thick as the BelowZero). 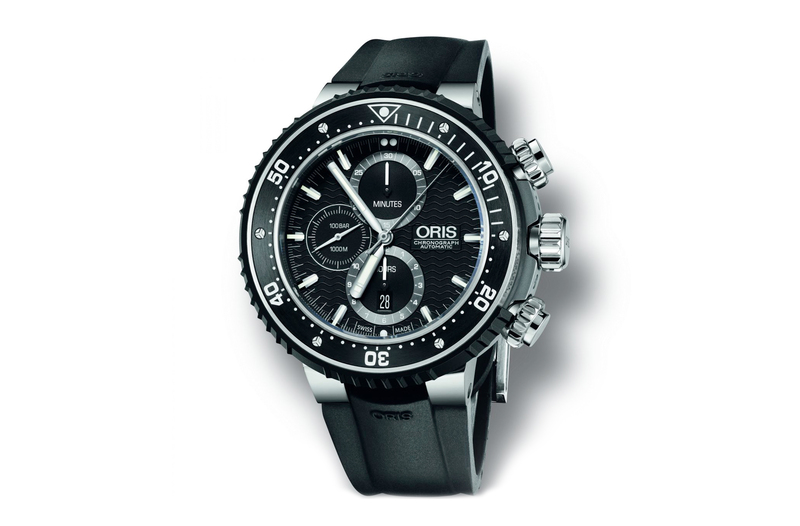 The Oris Pro Diver Automatic Chronograph Watch is a tank of a diving watch that is built on fantastic craftsmanship and a lot of thick materials. With a titanium case that’s 51mm in diameter and 2cm in thickness, the Sea-dweller really looks not so mighty in comparison. The Pro Diver is water resistant up to 1000 meters (just like the Hamilton watches) and features a helium escape valve (just like the Rolex). Not only does it feature the usual aspects of the other watches in our list, but also a ‘Rotation Safety System’ which is unique to Oris. 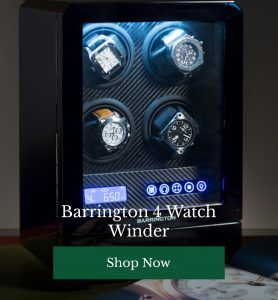 The Rotation Safety System works with the bezel, having to pull it up to rotate to avoid accidental nudging as well as working as bumper to reduce the impact of any bumps. – Titanium bracelet and case. – Security folding clasp with extension.